Strong, peppery, and robust arent words that youd traditionally use to describe a Macanudo cigar, but Cru Royale is not your typical Macanudo. These stronger-than-usual stogies are made with a spicy blend of Brazilian, Dominican, and Nicaraguan long fillers, along with specially-grown Dominican binders, and are finally topped off with dark and oily Ecuadorian Habano wrappers. Expect a complex, woody smoke with notes of coffee, cocoa, caramel, and pepper that will coat the palate beautifully. Macanudo Cru Royale Robusto serves up lush, layered flavor in a traditional 5x50 vitola. 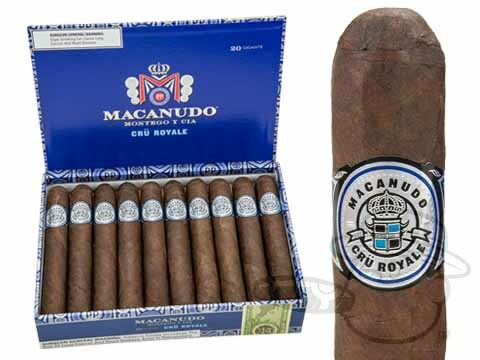 Macanudo Cru Royale Robusto is rated 3.4 out of 5 based on 2 customer ratings.